– second, ”Palais de Tokyo” is the name of an institution: the contemporary art centre hosted by one of the two structures forming Palais de Tokyo building (that’s where it is confusing); the other half of the 1937 building hosting Paris’s modern art museum. Whether you want to visit one or the other art institution, the entrance is on Avenue du President Wilson, up the hill. Thus, many visitors, including regulars, may have never admired the impressive sculptures adorning the esplanade down the hill. 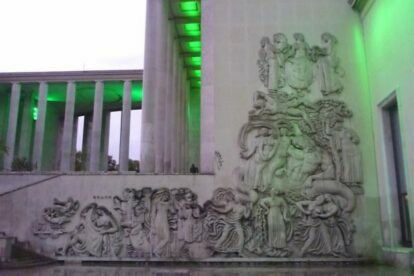 These sculptures, of a similar style as the nearby sculpted groups framing the Trocadero fountains, have classical subjects (mostly mythological) but a contemporary treatment: full of joy, life, happiness, they are in a way quite significant of those pre-WW2 years, with the birth of ”congés payés”, annual leave and sports and tourism – a major social improvement in 1936 in France. The very big relief sculptures were sculpted by Alfred Janniot, also famous for his exotic work at the Palais de la Porte Dorée (once the Colonial Exhibition centre, today museum about immigration, check Adam’s article). The best place to appreciate the sculpted programme is Avenue de New York (along the river), once called Quai de Tokio (hence the name of the palace – another typically confusing Parisian fact).